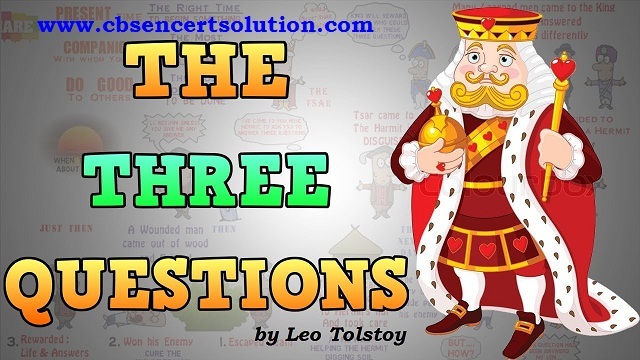 Question 1: Why did the king want to know answers to three questions? 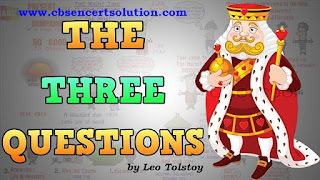 Answer: The king wanted to know answers to three questions because he thought that he would never fail in any venture if he knew the right answers to these three questions. (i) to fetch wise men. (ii) to find answers to the questions. (iii) to look for the wise hermit. (iv) to announce a reward for those who could answer the questions. Question: Complete the following sentences by adding the appropriate parts of the sentences given in the box. 1. Many wise men answered the king’s questions, but their answers were so varied that the king was not satisfied. 2. Someone suggested that there should be a council of wise men to help the king act at the right time. 3. Someone else suggested that the king should have a timetable and follow it strictly. 4. The king requested the hermit to hermit to answer three questions. 5. The king washed and dressed the bearded man’s wound, but the bleeding would not stop. Question 1: Why was the king advised to go to the magicians? Answer: Some of the wise men who came to answer the king’s questions said that there might be some urgent problems which will need quick action instead of waiting for the council’s decision. And, therefore, in order to decide the right time to do something, one needs to know the future. Since only magicians could tell about the future and decide the right time in no time so, they advised the king to go to the magicians. Question 2: In answer to the second question, whose advice did the people say would be important to the king? Answer: In answer to the second question, people said that the advices of the king’s councilors or the priests, or the doctors or the king’s soldiers would be important to the king. Question 3: What suggestions were made in answer to the third question? Answer: In answer to the third question, some men suggested science would be most important. Some others said fighting while some advised that religious worship would be the best affairs for the king to do. Question 4: Did the wise men win the reward? If not, why not? Answer: No, the wise men did not win the reward because the answers to the king’s questions were so different, that he was not satisfied and gave no reward to anyone. Question 5: How did the king and the hermit help the wounded man? Answer: The king and the hermit removed the wounded man’s clothing, washed the wound in his stomach and covered it with a handkerchief. The king redressed the wound until the bleeding stopped. The king brought fresh water and gave it him. Finally, with the hermit’s help the king carried the wounded man into the hut and laid him on the bed. Question 6: (i) Who was the bearded man? (ii) Why did he ask the king’s forgiveness? (i) The bearded man was an enemy of the king. His grievance was that the king had put his brother to death and taken away all his properties. His intention was to take revenge and kill the king on his way home. (ii) The bearded man felt very grateful to the king who had saved his life. His attitude was changed altogether. He begged the king to forgive him and wished to serve the king as a faithful servant. Question 7: The king forgave the bearded man. What did he do to show his forgiveness? Answer: The king was glad to make peace with his enemy. He not only forgave him but also sent doctor and servants to look after him. The king also promised the bearded man to return his properties. Question 8: What were the hermit’s answers to the three questions? Write each answer separately. Which answer do you like the most and why? Answer: In answer to the king’s first question, the hermit said there is only one important time which is ‘Now’ or ‘The present’. In answer to the king’s second question, the hermit said the most important person is the person with whom we are at a given time. We can make an everlasting friendship with him. In response to the king’s third question the hermit said, the most important business is to do a good to that person with whom one is at that moment. I would say the best answer is that of the first question - the most important time is ‘Now’ or the present. Because, ‘Past’ is gone while we don’t know about ‘Future’ but ‘Present’ is at hand when we can act. Question 1: Match items in list A with their meanings in list B. Answer: (i) - d. (ii) - a. (iii) - e. (iv) - f. (v) - g. (vi) - c. (vii) - b. Question 2: Each of the following sentences has two blanks. Fill in the blanks with appropriate forms of the word given in the brackets. Answer: (i) The judge said that only fresh evidence would make him change his judgment. (ii) I didn’t notice any serious difference of opinion among the debaters, although they differed from one another over small points. (iii) It’s a fairly simple question to answer, but will you accept my answer as final? (iv) It isn’t necessary that necessity should always be the mother of invention. (v) Hermits are wise men. How they acquire their wisdom, no one can tell. (vi) The committee has decided to make Jagdish captain of the team. The decision is likely to please everyone. (vii) Asking for forgiveness is as noble as willingness to forgive.